Crisponi syndrome is a rare autosomal recessive disorder caused by mutation in the Cytokine Receptor-Like Factor1 (CRLF1) gene. The cardinal features of this syndrome, which are always evident at birth, consist of muscular contractions of the facial muscles in response to tactile stimuli with trismus simulating tetanic spasm, abundant salivation, major feeding and respiratory difficulties, characteristics dysmorphic features, camptodactyly and hyperthermia. In infancy and childhood they develop progressing kyphoscoliosis and developmental delay. Molecular analysis performed on DNA of our patient (and both parents) showed evidence of a new pathogenetic homozygous mutation never described before in the literature. Our case is one of 9 new mutations found in addition to 29 already described mutations, thus expanding the mutational spectrum of CRLF1 in Crisponi syndrome. 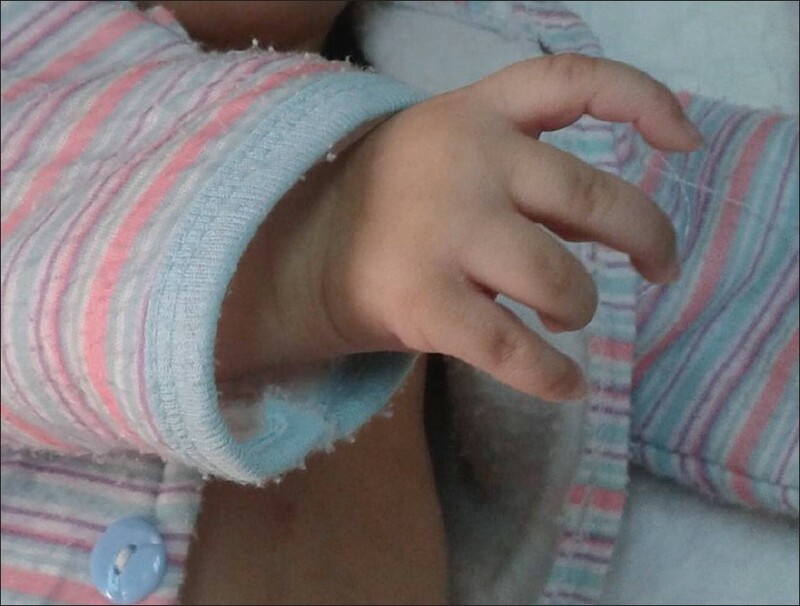 Baby girl S, a full-term newborn delivered after uneventful pregnancy in Prince Sultan Hospital (Taif, KSA) on 14/9/2011 by Caesarian Section with Apgar Score 9 and 9 at 1 and 5 minutes. 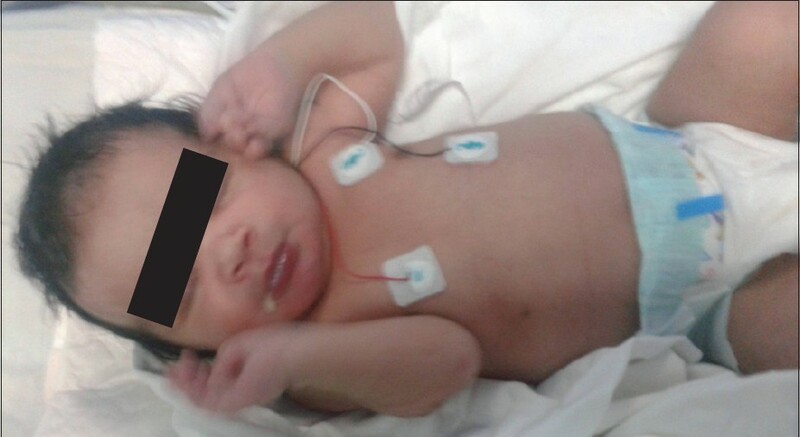 At the age of 3 days, the baby was referred to NICU at Al-Hada Military Hospital in Taif because of difficulty in feeding, and also to rule out neonatal sepsis. Consanguineous Saudi Parents (1 st degree cousins). Mother is Gravida 10 Para 8 + 1 with history of 2 male sibling mortalities. One died at home 16 years ago (at age of 6 months) without diagnosis. The other sibling died at home 3 years ago (at age of 3 years) but was diagnosed as Crisponi syndrome in Riyadh Military Hospital (only phonotypical): no genetic study was done for him. He remained till the end of his life with developmental delay, home oxygen and gastrostomy tube feeding. A full term baby girl weighing 4.2 kg at birth with 56 cm length, and 35.5 cm head circumference. She was mildly distressed, with O2 saturation 88-94% (FiO2 30% by nasal cannula). Other vital signs were within normal ranges. FACE : Rounded, chubby with long philtrum, broad nose and anteverted nostrils, increased salivation, frequent startling, with recurrent marked facial muscles contractions with circum-oral cyanosis upon any tactile stimulation, attempts to suction or during crying [Figure 1],[Figure 2],[Figure 3] and [Figure 4]. HANDS : Bilateral camptodactyly with flexion deformities of fingers with ulnar deviation and adducted thumbs [Figure 2] and [Figure 3]. No other abnormalities were detected on other systemic examination. Sepsis was ruled out after septic screening. 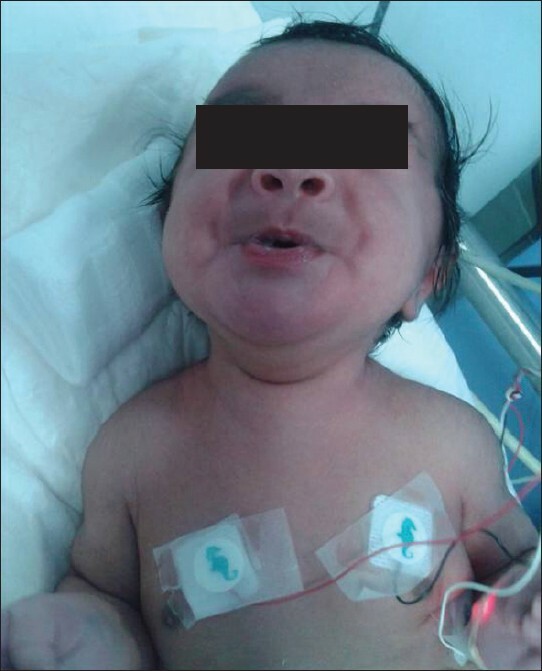 Baby had initial mild respiratory distress with tetaniform facial muscle contractions, increased salivation and short apneas. The characteristic contractions slowly disappeared when she calmed or slept. Crisponi phenotype was diagnosed after history, picking the clinical signs, reviewing the literature and discussion with Dr. Laura Crisponi who offered to perform the molecular test for the CRLF1 gene to confirm the diagnosis on research basis in his laboratory in Monserrato University in Italy. Samples from baby and both parents were sent. In the second week, baby was shifted to cot, weaned off O2 and was tolerating room air with accepted saturation. Baby was always having great feeding difficulties, not sucking, or swallowing and kept always on nasogastric tube feeding. By the end of the second week she was noticed to have recurrent mild hyperthermia (38.0 - 38.8°C), each time sepsis was ruled out. Baby had no more fever after 6-8 weeks of life. From the second month she had gradual decreasing attacks of facial muscle contractions and circum-oral cyanosis. These contractions remained only during crying but with decreasing intensity. DNA study confirmed the diagnosis of Crisponi syndrome, with evidence of new mutation; a single nucleotide insertion that caused loss of function in CRLF1 protein, which is patho-genetic. 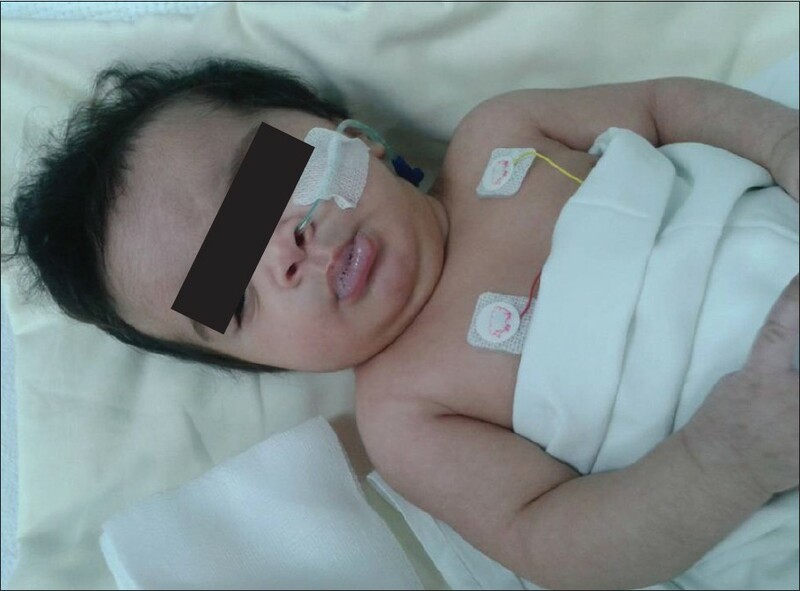 Baby remained nasogastric tube-feeding dependent [Figure 5], all trials to encourage any oral sucking failed. So a gastrostomy tube was inserted, the baby tolerated feeding through it, with below average growth in spite of high caloric nutrition. She was discharged home at age of 3 months. The discharge weight was 5 kg (25 th centile). 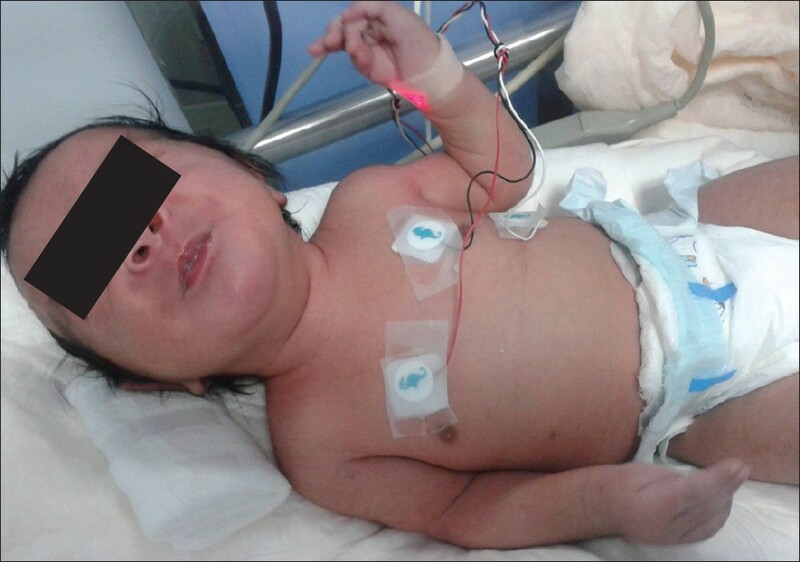 Patient was seen in the follow-up clinic after discharge, her last visit [Figure 6] was on 3/3/2012 (age of 5.5 months) found with mild developmental delay, with weight 5.4 kg, (declines to 10 th centile), length 65 cm and head circumference 42 cm. She had few problems with the gastrostomy tube feeding. No evidence of kyphoscoliosis, no seizures, no apneas, or respiratory problems were observed. Camptodactyly was still evident [Figure 7], with some salivation, easily startled and occasional facial contractions specially upon startling and during crying. She recognized her mother, smiled, followed objects (with mild interest to the surroundings), held head up but not steady and sat with support. Feeding instructions were given to improve the nutritional caloric intake via the gastrostomy tube [Figure 6]. Crisponi syndrome was described for the first time in 1996 by Giangiorgio Crisponi. It was genetically diagnosed in families in Italy, Turkey and Spain, with more prevalence (1: 20,000) in Sardinia, Italy. Crisponi syndrome patients also have recurrent hyperthermia, occasionally high grade with seizures, but it is often only low grade, this hyperthermia will be resolved gradually in months. But death may occur in the first few months because of hyperthermic crisis and generalized seizures. In late infancy and childhood up to adolescence, Crisponi syndrome patients develop progressing thoracolumbar kyphoscoliosis (which may require corset therapy, or corrective surgery), developmental delay, Attention Deficit Hyperactivity Disorder (ADHD), requiring special schools, temperature instability and paradoxical cold-induced sweating. Crisponi syndrome is caused by mutation in CRLF1 gene (Cytokine Receptor Like Factor1), which is located in Chromosome 19 p13.1-p12 and is allelic to CISS-1 , (Cold Induced Sweating Syndrome -1), which was first described by Sohar in 1978. Recently, it is suggested to rename the two genetic entities with the broader term of Sohar-Crispony Syndrome. The molecular analysis (of our patient and both her parents) has been carried out by: Dott. ssa Laura Crisponi and Prof. Francesco Cucca; from the Istituto di Neurogenetica with Neurofarmacologia, Consiglio Nazionale delle Ricerche, Cagliari, Italy) for all nine CRLF1 coding regions (including the exon-intron junctions) by sequencing analysis of the PCR products. This analysis showed the presence of the mutation c.983_984insG (P. S328RfsXI) in exon 6 in homozygosity, never described in literature as responsible of the clinical phenotype. Both parents carry the same mutation in heterozygosity. These findings confirm the familial origin of the syndrome. With better understanding of the pathogenesis of the disease and the molecular pathway where CRLF1 is involved, it will be expected to define the relation between each genetic mutation and its clinical phenotype relevance. The manifestations of Crispony syndrome at birth is mimicking neonatal tetanus, with frequent facial spasms and trismus. Those patients have peculiar characteristic features and major feeding difficulties. Our baby was presented with exactly a similar picture. Homozygous CRLF1 gene mutation confirmed the diagnosis of Crisponi syndrome. This molecular genetic testing is available on a research basis only. Our case was found to be one of the 9 new mutations in addition to the previously existing 29 mutations; thus expanding the mutational spectrum of the CRLF1 gene in Crisponi syndrome. Advanced genetic technology will help in more understanding the pathogenesis of the syndrome. The Author would like to thank the patient for providing consent to use her photograph in this article. 1. 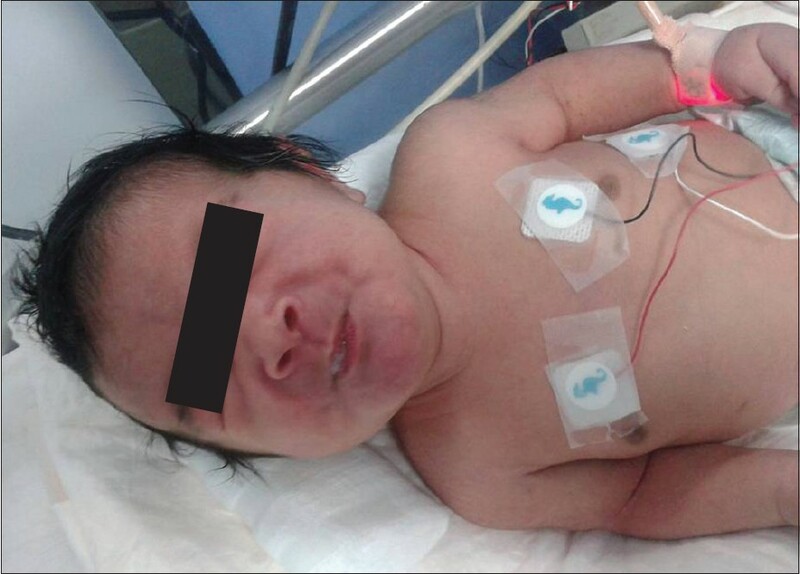 Crisponi G. Autosomal recessive disorder with muscle contractions resembling neonatal tetanus, characteristic face, camptodactyly, hyperthermia, and sudden death: A new syndrome? AM J Med Genet 1996;62:365-71. 2. Crisponi L, Crisponi G, Meloni A, Toliat MR, Nurnberg G, Usala G, et al. Crisponi Syndrome is caused by mutations in the CRLF1 gene and is allelic to cold-induced sweating syndrome type1. Am J Hum Genet 2007;80:971-81. 3. Dagoneau N, Bellais S, Blanchet P, Sarda P, Al-Gazali LI, Di Rocco M, et al. Mutations in cytokine receptor-like factor 1 (CRLF1) account for both Crisponi and cold-induced sweating syndromes . Am J Hum Genet 2007;80:966-70. 4. Sohar E, Scenfeld Y, Udassin R, Magazanik A, Revach M. Cold-induced profuse sweating on back and chest: A new genetic entity? Lancet 1978;2:1073-4. 5. Stanke M, Duong CV, Pape M, Geissen M, Burbach G, Deller T, et al. Target-dependent specification of the neurotransmitter phenotype: Cholinergic differentiation of sympathetic neurons is mediated in vivo by gp 130 signaling. Development 2006;133:141-50. 6. Alexander WS, Rakar S, Robb L, Farley A, Willson TA, Zhang JG, et al. Suckling defect in mice lacking the soluble haemopoietin receptor NR6. Curr Biol 1999;9:605-8. 7. Hahn AF, Jones DL, Knappskog PM, Boman H, McLoed JG. Cold-induced sweating syndrome. A report of two cases and demonstration of genetic heterogeneity. J Neurol Sci 2006;250:62-70. 8. Accorsi P, Giordano L, Faravelli F. Crisponi syndrome: Report of a further patient. Am J Med Genet 2003;123A:183-5.